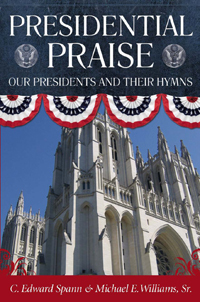 Presidential Praise: Our Presidents and Their Hymns offers the most comprehensive coverage ever written of the influence of hymns on the lives and administrations of America’s presidents. Each chapter begins with Michael Williams’s concise presentation of each president’s path to the White House and his accomplishments and failures as president. C. Edward Spann then introduces how each president regarded music, whether or not he was musical, and music in the White House during each president’s administration. These hymns may be related to developments in the life of the president, including his spiritual journey, major decisions he had to make as president, or even his selection of the inaugural Scripture. Spann then tells the story of how the hymn was written, both the words and the music. Presenting this scholarly material in an inspiring manner is part of the delight of the book. In doing so, the book covers a panorama of hymnody from 1614 to the 1980s. After an interpretation of the words, it is demonstrated why the chosen hymns were meaningful to each president. The format of each chapter reveals this special emphasis that can’t be found elsewhere.